Delta Force Paintball West London: Berkshire, Maidenhead and Reading! If you’re looking to play Paintball in West London, then take a trip to any one of three five star Delta Force Paintball centres located in Berkshire, Maidenhead and Reading. 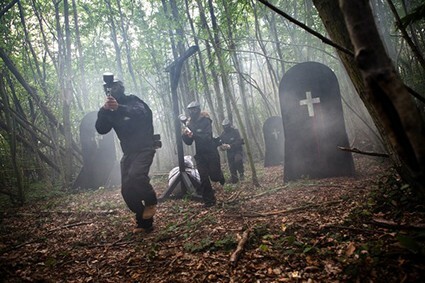 Set only minutes from the M25 and M40 is our Berkshire paintball centre, near Maidenhead. This leading paintball venue features several amazing game zones, including the thrilling zombie apocalyptic combat scenario Zombies’ Crypt, featuring abandoned red double-decker buses on the deserted streets of the city. Other game zones include Castle Wallenberg, Siege of Stalingrad and The Black Pearl. 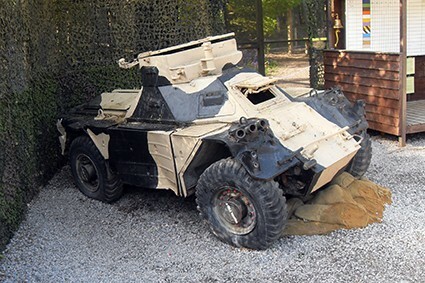 However, if that’s not quite your cup of tea, take a look at our Maidenhead paintball centre. The venue recently received a refit and refurbishment and is one of our most modern paintball centres. It’s also really convenient to get to being located just off Junction 8/9 of the M4. Its state-of-the-art game zones feature amazing Hollywood-style props including a fleet of large Soviet-era military tucks taken direct from the 007 Bond film ‘Tomorrow Never Dies’ as well as a 50ft long galleon! Adult players can even take advantage of our exciting paintball pyrotechnics we have on offer for an additional surcharge. In addition to this, Delta Force Paintball Maidenhead has a basecamp with first-class facilities. Delta Force always strives to bring you the best paintball experience possible. So why not book a day of paintball for you and your friends at Delta Force Paintball West London and experience it for yourself? You won’t be disappointed! But that’s not all… If you venture slightly further afield, you’ll find our Reading paintball centre. Based on a private estate, the entrance features a 1960s Daimler Derret MK2/3, used by the British army! This statement piece really makes an impression and sets the tone for the military theme which continues inside.